For the best sunsets on the island! Arguably one of the best spots to watch the sunset, Amsterdam Bar offers a range of activities to fill your day. 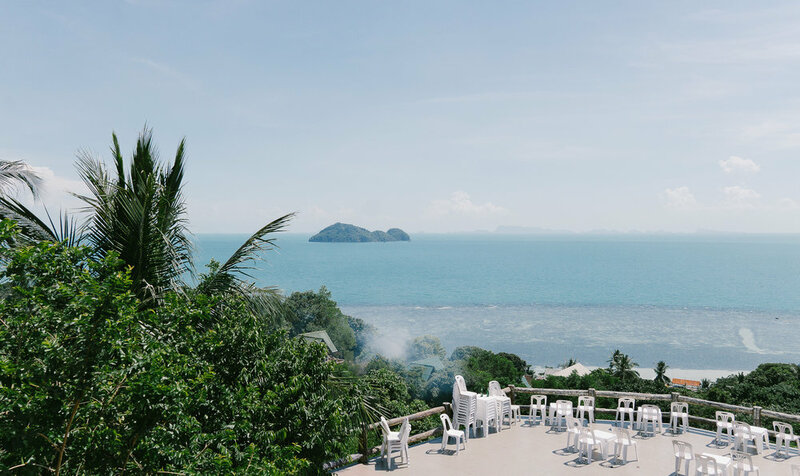 Nestled high in the hills across the road from Kupu Kupu Resort, it offers a breathtaking view of the open water and Ang Thong Marine Park. It has a well stocked bar with various choices of creative cocktails, spirits, local / important beers, and even marijuana to help you have a relaxing, lazy afternoon. There is also a big bool where you can take a dip and hang out in while watching the sun go down. ocated next to Secret Beach, the name is a bit misleading because this beach and bar isn't that secretive, might be a bit less developed than others, but definitely not a secret. However, the bar overlooking the beach is one of them my favorite. The drinks are delicious and they have American food here if you're craving some after countless Pad Thais and Curries. It's a bit more expensive than I would normally pay for a meal but you're paying for the ambiance. 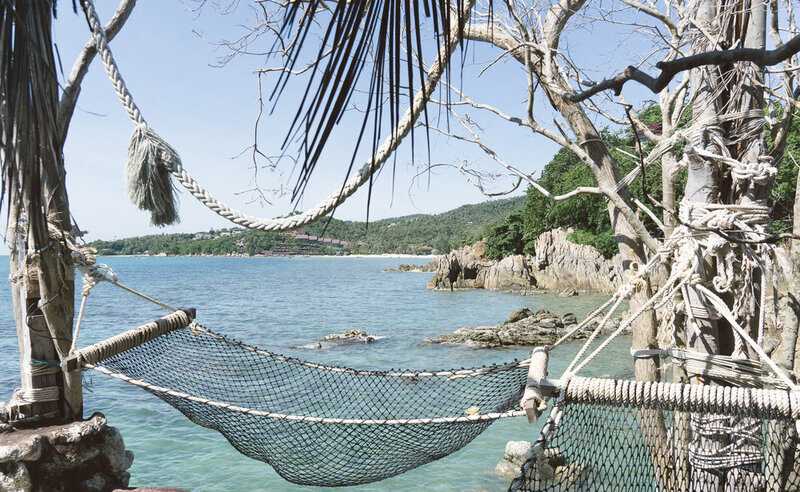 The best parts are the hammocks that hang over the water and the best thing on a chill afternoon. For a bit more of a rush, you can jump into the water and have food thrown out so that a ton of fish will swamp you. They won't hurt! They might nibble on your toes but all harmless. Beach after beach after beach! It's an island so you should expect there to be an abundance number of beaches here and each and everyone is just as amazing as the other. It's hard to go wrong with any of the beaches here. The above 3 are my favorite and by google mapping or asking your hostel / hotel for directions will get you here easily. The way we traveled around the island was on motorbikes and I think it's the best way to explore the island and get to these beaches. Every night, there is a party on Haad Rin Beach, where Full Moon takes place. Although it's not as crazy or jam-packed as the Full Moon Party, it's still a great time! You'll dance on the beach, spend money on alcohol buckets, and maybe inhale some helium balloons. But every night, without fail, if you head here after 11pm, you'll find people dancing on the beach and music blasting. It'll give you a teaser for how the Full Moon Party will be like! Tucked away behind giant rocks that overlook the gorgeous bay of Haad Yuan, you'll find a bar called "Eden Garden," where the party takes place. Warning, this party isn't for the faint of heart since it's the most eccentric of all the parties on Koh Phangan, and probably all of the Thailand. Some consider it the best party in all of Thailand! You need to either take a boat or four-shell drive taxi to get here. The walking path is narrow and over a steep ledge so don't come here completely wasted, as it can get dangerous. DJ's will throw down heavy techno and house until the last person standing. This is like Ibiza but in Thailand! Instead of your typical beach parties, this is head in the Jungle, hence the name, and takes place a couple days before a Full Moon Party. With a crazy stage set up, lights, fire breathers, and electronic music throughout the night, you'll no doubt have a good time. The Floating Bar on Loi Lay offers a floating party every Sunday, where you can enjoy tech, funky and deep house music played by local DJ's. Loi Lay is special in that it is most frequented by expats and locals and so you’ll get much less of a touristy scene. Music starts playing at 9pm and continues throughout the night. There is a smaller food night market every day where you could go to grab some dinner but they go all out every Saturday. The area of Thong Sala on Koh Phangan is filled with food, clothes, and souvenirs vendors, everything you've experienced at other night markets in Southeast Asia. You might have only heard about all the diving that goes on in Koh Tao but from Koh Phangan you can also easily get trips to Sail Rock since it's much closer. Sail Rock is the most renowned diving spot in the Gulf of Thailand that offers four different sites to drive with a ton of Marine animals and underwater life. This is also a deep dive destination but if you have your Advanced PADI, it'll come in handy here. Plan to have a good night sleep beforehand because you'll be departing pretty early (~7am) for Sail Rock since it's a bit of a trip from Koh Phangan. You'll be doing multiple dives before heading back to the island. The "Wipe-Out" of Koh Phangan! Remember that TV show where people have to get through an obstacle course over the water and all you want to see is them "wiping out". This is exactly what The Challenge Phangan is, a floating obstacle course with stepping stones, monkey bars, climbing walls, rolling barrels and an obstacle facing the "Big Read Balls of Satan." It's definitely a fantastic time and a bit different than the partying and eating you've probably been doing in Thailand. There is also a bar and restaurant so you can get beaten up by the obstacle course then head inside to replenish. They also offer free kayaks for every customer to explore the lake. I'm not a yogi by any means so I didn't look into doing this but I met a ton of people coming to Koh Phangan for yoga. There are a ton of yoga retreats on the island! Since I didn't do it, I can't recommend any or give more information beyond that there is a good yoga presence / community on the island. And there you have it, everything you can do while in Koh Phangan that doesn't involve the Full Moon Party! I hope you enjoy the island as much as I did!